Rosicky's goal face. Photo: Daily Mail. Of course, if you read that piece, you'll also note that I said that games aren't played on paper. They're played inside of the projectors at the Blind Pig. Or something. This is a pivotal game for Arsene Wenger's blue and lighter blue army (they will be wearing that change kit for this one, I assume.) Win this and it's four straight in the league and increased breathing room over a rival with similar European dreams. Liverpool have a game in hand, but Arsenal will be 10 points clear with a win and only four points clear with a loss. If Liverpool beats Everton in their game in hand, then it's either seven points or one. It's a European six-pointer! Now's not the time to continue basking in the glow of winning the North London derby; amazing as it was, that's in the past. Now is the time to pick up three more points and get a tricky fixture out of the way. dance in front of Bert van Marwijk. That news about Vermaelen is worrying because, just like old times, Arsenal have almost no center backs again. All of a sudden, Johan Djourou is out for a month with a groin injury. When did that happen? He wasn't on the bench last week, so it was either in training or on the horrible, horrible Stadium of Light pitch (if it was, then that's five players that got hurt over two weeks at Sunderland.) Sebastien Squillaci is out, too, so Ignasi Miquel is getting closer to being called into action again, though Alex Song dropping back is the more likely scenario right now. In good injury news, Andre Santos is on the way back and is about two weeks away from returning to the pitch. So, now that all of the fullbacks are getting back to health, it's the center backs' turn to be hurt. Got it. Tomas Rosicky withdrew from the Czech Republic squad this week with a back problem; hopefully it is not serious and he is fit to return to the squad because he was magnificent last week. All I've heard is "doubtful." Aaron Ramsey will likely miss one more week with his injury suffered at Sunderland. With everyone available up front, there's a question of starting Gervinho, Alex Oxlade-Chamberlain, or as Wenger did against Spurs, ex-Liverpool Yossi Benayoun. If Rosicky doesn't pass fit, I think Benayoun is a certainty in that role, leaving the left wing to either the Ox or the Forehead. Predicted XI: Szczesny, Sagna, Vermaelen, Koscielny, Gibbs, Song, Arteta, Benayoun, Oxlade-Chamberlain, Walcott, van Persie. Damn, you can't tell if he's limping from a still photo. Liverpool went into last week's Carling Cup final with only one injury to their side, as Lucas is out for the season with ligament damage in his knee. Daniel Agger came into the game as a doubt with back problems but played anyway, then suffered broken ribs in the 86th minute and was replaced. The defender will miss "a few weeks." Jamie Carragher will start in his place. Not England captain Steven Gerrard left England's friendly against Holland in the 32nd minute on Wednesday with tightness in his hamstring. Liverpool will sweat over his fitness test, though Stuart Pearce did some damage control by saying it was "precaution," so right now, there's no word on whether he will be available for this match or not. The Reds are a much better side when he's pulling the strings, so I can't really see him missing unless the injury is more serious than first thought, or Pearce was lying. Glen Johnson pulled out of the England squad after a minor injury on Tuesday, but is also more likely than not to feature. Johnson has had a career of hamstring problems. Last week, Johnson's penalty in the shootout gave Liverpool the lead in the fifth round before Gerrard's cousin Anthony missed for Cardiff to end the match. 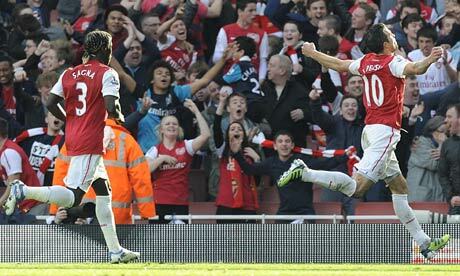 goal, which brought the Gunners back level. Liverpool might have the Carling Cup in tow and FA Cup aspirations, but their league form is in the tank. While Arsenal have picked up 10 points in their last four league games, Liverpool have picked up the same number in their last nine. For both sides, this match is going to be a question of whether they are able to pick up where they left off. For Arsenal, the task will be to duplicate the final 50 minutes against Spurs. For Liverpool, they are obviously riding high after winning silverware, though they were not particularly impressive against Championship side Cardiff City at Wembley. The biggest talking point in terms of form for this match will be how Liverpool performs at home and how Arsenal performs on the road. In this respect, it's advantage Liverpool. The Reds have not lost a home game this season, but in the league, they haven't won much either. In 12 league games at Anfield, Liverpool have just four wins, coupled with eight, count 'em, eight draws. Liverpool have fared better in the cups; however, their first five ties in the Carling Cup were away from home. It was only the second leg match against Manchester City that was played at Anfield and that was a 2-2 draw that saw them through on aggregate. Liverpool have won all three of their home games in the FA Cup, but aside from beating Manchester United, they've beaten Oldham Athletic and Brighton & Hove Albion. On the whole, it's seven wins and nine draws at Anfield this season for Liverpool. And the wins were against: Manchester United, Newcastle United, three sides in danger of relegation (Wolves, QPR, and Bolton,) and the two aforementioned lower division sides. On that note, you would have to think Arsenal fancy their chances at nicking a result tomorrow. But, since beating Aston Villa on December 21, the Gunners have just one road win in six tries, and it took a comeback and Thierry Henry to do that at Sunderland. They lost to Fulham just after New Year's, lost to Swansea two weeks later, drew Bolton at the start of February, then beat Sunderland in the league before their disastrous week in Europe and the FA Cup. During the 2009/10 season, Arsenal played Liverpool three times and won all three (both in the league and once in the Carling Cup.) The goal scorers for Arsenal in those three games? It was Fran Merida and Nick Bendtner in the Carling Cup, a Glen Johnson own goal and Andrei Arshavin at Anfield, and Abou Diaby in a 1-0 win at the Emirates. Since then, over last year and the first half of this year, Arsenal have not won in three tries against the Reds. These sides drew both matches 1-1 last season before Liverpool won the reverse of this fixture in August, 2-0 at the Emirates. Liverpool, of course, in that win faced a different Arsenal side than the one that exists now. Arsenal's XI that day saw Carl Jenkinson start in place of an injured Kieran Gibbs, Samir Nasri in his final Arsenal appearance, Emmanuel Frimpong started for the banned Alex Song, and Ignasi Miquel had to come on when Laurent Koscielny picked up an injury after only a quarter of an hour. Frimpong was later sent off in the 70th, and Liverpool opened the scoring eight minutes later on an unfortunate Arsenal own goal. Things are stranger if you look at the squad that started the last time Arsenal played at Anfield, in August of 2010. That XI was: Manuel Almunia, Bacary Sagna, Laurent Koscielny, Thomas Vermaelen, Gael Clichy, Jack Wilshere, Abou Diaby, Samir Nasri, Andrei Arshavin, Emmanuel Eboue, and Marouane Chamakh. Of that 11, four are gone, two are hurt, two are out of favor, and only those three that remain from the defense will likely start again tomorrow. 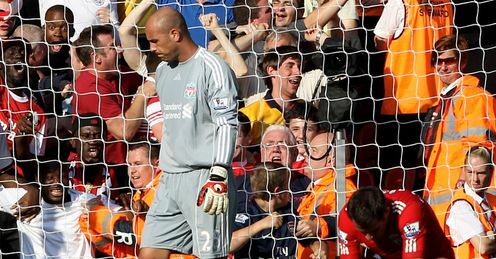 Liverpool led for much of the second half 1-0 despite being on ten men, but Chamakh forced Pepe Reina into an own goal just before the end of regular time and Arsenal stole a point. Six of the last 12 meetings between these two sides have ended level at 1-1. Arsenal have not lost a match at Anfield since April of 2008, which was in the Champions League and is still a crushing loss to think about. Their last league loss at Anfield was in 2007, when Peter Crouch had a hat trick. match back after returning from cancer treatment, in 2010. Great to see. Photo: Telegraph. The referee is Lancashire-based Mark Halsey. At the start of the 2009/10 season, Halsey was in charge of Arsenal's season opening match which took place in Liverpool, an emphatic 6-1 thrashing of Everton in which five different players scored goals for the Gunners. Before kick-off in that game, Halsey was talking to his fellow officials, and told them, "Look, I need your help today because I’ve got cancer." What Halsey originally thought was just a persistent sore throat turned out to be lymphoma. Halsey was out of action for almost eight months, but by March of 2010, his cancer was in remission and he passed a fitness test. He returned to work in the Football League that April, and to the Premier League by last season's opening day. Halsey has not yet worked an Arsenal match this year. Last year, he took charge of Arsenal's 2-0 win at Wolves, 3-0 Carling Cup second leg semifinal win over Ipswich Town, and 3-1 loss at Stoke City. For Liverpool, he has worked one match this year, their 2-1 win over Manchester United in the fourth round of the FA Cup. Last week, Halsey was working in League One, taking charge of the Steel City derby, as Sheffield Wednesday beat Sheffield United, 1-0. In 22 games across various levels of football this season, Mark Halsey has not shown a red card. He has shown 50 yellow cards. Over this year and last, he's shown only one red card. It was to Liverpool, to Lucas for a second yellow, in a loss to Stoke. No, no, no. It's "Mike Ashley Is Great Stadium." Six matches will kick off at 10:00 a.m. Eastern; there are no late games on Saturday. Chelsea will take a trip to the Hawthorns to face West Bromwich Albion, Manchester City hosts Bolton at Eastlands, Blackburn Rovers hosts Aston Villa at Ewood Park, QPR welcomes Everton to Loftus Road, Norwich travels to the Britannia to face Stoke, and Swansea will face Wigan away at the DW. Three more matches on Sunday close out the weekend. Sunday starts at 7:00 Eastern with the Tyne & Wear derby, as Newcastle hosts Sunderland at Don't Call It St. James' Park. The middle of the triple-header starts at 9:05, as Fulham hosts Wolves at the Cottage. The weekend and the triple-header end as Tottenham Hotspur, still licking their wounds from last week, host Manchester United at the Lane. These are the revere fixtures of those played the weekend of August 20-21.